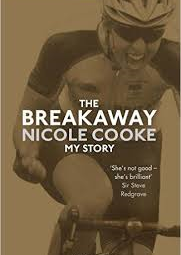 I often wonder how women like Nicole Cooke become women like Nicole Cooke, strong and courageous enough to earn the titles of a World and Olympic cyclist champion. A mother, I am always looking for ways to empower my daughter and help her become competitive and strong, in mind and in body. Nicole Cooke seems to have been born this way. Her Welsh childhood “set [her] up for a life where exploration and adventure into the unknown were a significant element.” With parents that encouraged their children’s (Craig and Nicole) athleticism, they both played tennis and rode their own bikes across the country as vacation time. Nicole Cooke was racing her bike across Wales and holding it upright in a track stand with her brother by the time she was only eight years old: “Cycling was a means of transport, a freedom, a method of getting to somewhere where exciting things could happen more quickly than walking.” It’s only natural, then, that her bike became the means to her empowerment as a professional cyclist. At eleven, she competed in the Welsh U12 Championships, what she considers to be her “first serious event…a turning point. I beat the boys, who were undoubtedly stronger than me, and beat them with technique and wits.” This “technique and wits” strategy employed by a girl so young and yet so determined, was used throughout her journey as a road racer when combatting not only gender and age discrimination in a male dominated sport but also competitive pettiness by the men who held superior positions in agencies that determined who would compete, when, where, and how often. One such example is adeptly illustrated when, at the age of 16, Nicole beat Yvonne McGregor, WCPP’s favorite cyclist, not just once, but twice, awarding her the British Road Race Champion title for 1999. She was a junior competing in a senior women’s race (there was no junior girls’ event that year), marking her the youngest rider to win the title. Her punishment for these wins was twofold: the UCI (Union Cycliste International) enacted a new ruling that would keep her out of the 2000 Olympics in Sydney when they raised the age limit to 19 and WCPP (World Class Performance Programme) instructed their senior racers to apply team tactics (which is against the road racing rules) as a means of preventing Nicole from getting to the finish line or close to their chosen champ. Of course, this did not dissuade Nicole Cooke from moving forward, whether she ended her races first, second, or eighth. At 17, she took the multiple attacks on her in a 3-hour race as a compliment: she was the one to beat. WCPP knew it, her opponents – all older than her – knew it, and the world knew it. My heart rose; nobody had started a leadout, they were too busy watching each other. I was going to catch them! With only 800m to go, I was back in the front group. The gold was still on. I tried to take some deep breaths but I just had to concentrate on the tactical positioning and movement. I went to the far left, watching everyone to my right – I needed to look only one way. With 400m to go, Caroline jumped hard. I was on to her like lightning, into her slipstream and closing her down fast. I carried my speed and blasted straight past her, totally focused on the line. It was still a way to go and now my legs were in agony, but I had to keep going. I had made my move and there was now no other option. I had a gap, they weren’t closing on me. I kept going. My legs screamed ‘pain’, my brain screamed ‘I’m going to win this!’ I threw my arms in the air as I crossed the line, I’d done it! In other parts of her memoir, Cooke exposes the use of drugs by professional athletes and inherent sexism of the cycling world, but in a most profound way, she also recounts the “Laurel and Hardy” antics and pettiness of BC and WCPP; these organizations attempted to discredit, demean, and bar her potential when she posed a threat to their team (while she was younger) and when she questioned their sexist and discriminatory approaches to training female cyclists, which included no payment for their racing efforts once they trained and rode as professionals: “It was obvious that politics and personal power plays within the still evolving WCPP were getting in the way of the organisation doing what the public paid it to do – support good athletes and help them become better.” Despite these consistent walls placed before her to derail her success, Nicole Cooke was made of different, stronger ilk. All she wanted was to race and win, to be her “own, rather demanding master.” And she did both –with huge success. In the end, she had the last word, both through her retirement speech and her memoir, exposing the inequality and corruption of the still male-dominated core of the cycling sport in a voice that refuses to be tamped down or controlled. More importantly, her memoir shows what a champ, a female trailblazer, feels like when she achieves her dreams, after she wins the rare Amstel Gold–Flèche Wallonne double: “Climbing up onto the top of the podium, the second time in three days, in front of a massive crowd, was everything I had dreamed of as a ten-year-old, charging up and down the hills on my little pink bike.” Her career as a professional cyclist proves to girls and women that there are great advantages that come with prevailing as a sportswoman bent on winning despite all the sexist and ridiculous barriers placed before her. But her strength –physical and mental – stands as a symbol of female power, showing little girls who ride their own pink bikes that hard work, integrity, and determination are the qualities inherent of winners empowered by their own volition. 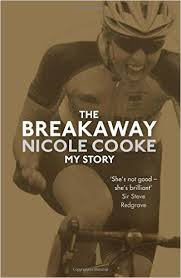 Nicole Cooke describes herself and her journey as a World and Olympic champion best in her closing chapter: “The winner in me was never satisfied with anything but the best.” Words all little girls and women should live by.